Excellent for extending the volatile compounds in citrus notes. Ideal for making scents with water and alcohol bases to avoid turbidity (cloudiness) or for use in alcohol-free (water based) fragrances. A non-ionic solubilizer and emulsifying agent that is obtained by reacting hydrogenated castor oil with ethylene oxide. 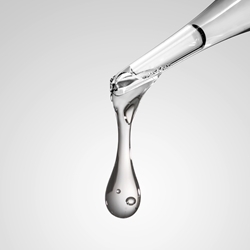 Cremophor® RH 40 is used to solubilize ethereal oils, perfume compositions, vitamins and hydrophobic active substances in aqueous- alcoholic and purely aqueous solutions. Stir into fragrance concentrate slow and gently to avoid bubbling. Making clear fragrance sprays is easy using this simple method. Mix the fragrance compounds into the pure Cremophor RH 40®. Combine Phenonip, if required, with the Cremophor CO40®. Add this mixture to the alcohol, if used, and blend well before adding any water. Combine the glycerin with the water. Add water slowly with good stirring to avoid cloudy solutions. The viscosity will initially increase as water is added, reaching a maximum at 40 % water, and will decrease greatly as more water is added. Rapid additions of water may result in cloudy mixtures. Slow, careful additions with thorough mixing is required. Combine the Cremophor RH 40® with the menthol and the fragrance with it. Add a few menthol crystals at a time and ensure that they have dissolved before testing and adding more. Slowly add the alcohol to this mixture using a whisk. Combine the panthenol with the water and add it slowly to the alcohol mixture. Adjust the pH to 5 using citric acid.